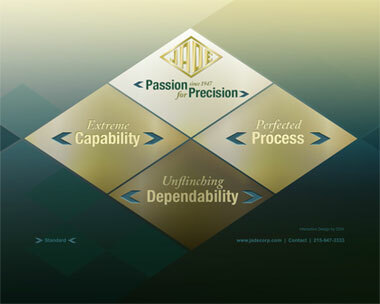 DDA developed this interactive sales presentation for Jade Equipment Corporation in 2011. DDA started by gathering and organizing all the information that Jade Corp. found crucial to present in the professional marketing tool. Next, DDA designed a user interface, ensuring that it would support easy navigation whether the user chose to receive the information linearly or instead chose to navigate through the topics that interested her most. DDA also provided the programming and animation services that make this professional marketing tool really come alive. Additionally, DDA provided its professional photography services, incorporating product and facility photographs shot both on-location and within DDA's studios into the media-rich presentation. Now, thanks to DDA's multidisciplinary professional services, the Jade Corp. has a marketing tool that provides sales information that is consistent and accessible, with a media-rich presentation that is sure to keep any viewer's attention.